I was so lucky to receive two skeins of this amazing soft yarn from Wool And The Gang. I was trying to decide what to make. Im a huge fan of knitted mittens, but my knitting abilities can be compared to my car engine abilities. Very poor. So, I decided to crochet a pair! This pattern comes with a dedication. And it also explains the name for the mittens. To Dad, Hubs, Geir Ove, Frank at Viking rescue service and Kåre at Statens Vegvesen ( State Highway Authority). Thank you! You made our day. And Im grateful for you all. Last Saturday, I was driving home from my dads cabin. Lots of snow up there. A small place called Hundeidvik. On the mountain there. In my eyes. That place is paradise. We had an amazing day in the snow. My kids and I. In the evening we decided to drive home. We had been driving for under 5 minutes when my ten yo said “Mum. I see smoke!”. I looked to the left and dark smoke came out of the heater on the left side of the car. And that intense smell. I must admit my brain froze and I went into this “survival mode”. I stopped the car and put the emergency lights on. Carried my kids to a safe place up the road, ran back and got their winter suits (it was freezing outside. Below zero celcius). Put up the warning sign up the road (it was very slippery outside. Ice on the road. I did not want another car to crash into us). First i called my dad. So I could get the kids back to the cabin. It was cold and they were tired. And than, my Iphone went black (it does not handle the cold weather. At all). So i just had to wait until my dad came, so I could charge my Iphone. I went back and saw no more smoke, but the car was filled with that intense smell. When my dad arrived (Thank you dad) i put my kids in his car. I called the rescue company that we have trough our insurance. And I had to wait until someone called me (a very busy evening. Many cars needed help due to the road condititos). I called my hubs and he tried to assist the best he could (not easy when you are hours away. At work.. He is always so calm). And my childhood friend Geir Ove. That “No problem, get it towed here. It will be ok” comment took a big weight of my shoulders. I was waiting for about an hour. I was told by the first one that responded to my call “Don`t touch anything, do not move the car!” So. I waited. Finally, my phone rang. “Hi, it is Frank from Viking rescue, im sorry that you had to wait. Its a very busy evening.” Almost instantly after the call some massive lights appeared behind my dads car. It was Statens Vegvesen (State Highway Patrol. I have no idea why he was out driving that night. But thank you Kåre for beeing there that evening)! He stopped and asked if everything was ok, and i said that i was talking to the rescue company. And now it gets a bit weird. Frank at Viking started asking me questions ( i must admit. When i saw the smoke. i did not even CONISDER to check if there was dripping water from anywhere. Or stuff like that. My reaction was “Stop safe, get the kids out!”) and suddenly wanted to ask the State Highway Patrol a question. I shouted out “exuse me? He wanted to ask you something!” I just handed out the phone and they started talking. He asked if he could borrow my keys, and I handed them out. He went down to my car, and started it up. I have no idea how long he sat there. But after a while he came back with both my keys and phone “Frank wants to talk to you”. They knew eachother! And together the had tried to figure out what caused it! “You can drive the car, but do NOT turn on your fan. I can come and get the car, but it will be hours of waiting. The car is ok to drive. I had the same car myself. Its the fan that probably is broken. And from what Kåre told me, the engine sounds fine.” Frank explained. They tried to find out what was wrong. What amazing kindness and service! I thanked him and I thanked Kåre (he even moved the car to a bus stop for me). I was so stunned. And stunned over their kindness. They was not forced to do these things. Kåre could have gotten in his car, and drove home. Frank could have let me wait. But instead. They took their time to help me. If a light appear in my car, I can open the manual and read what it means. But i do not think they have a “smoke coming out from you fan” section. I got startled that thay. But still. I have this amazing feeling of gratitude. To Dad, Hubs, Geir Ove, Frank and Kåre. You are my heroes! Thank you! And now for the pattern. Dedicated to the ones above. Link til det norske mønsteret finner du her! These mittens are a M/L . For a smaller size, skip round 7 and 8 on the mitten and round 7 and 8 on the thumb. Abbreviations: ch-chain, ss- slip stitch, dc – double crochet, htr- half treble crochet, tr – treble crochet, 5puff – 5 puff stitch, back post treble crochet – BP tr, front treble crochet – FP tr. The last two stitches makes the ribbed edge. You can find the tutorial for it here! 5Puff: Yo, insert hook in indicated st, yo, pull lp through st and make lp same height as previous sts in working row, (yo, insert hook in same st, yo, pull lp through st and make lp same height as working row) four times, yo, pull through all 11 lps on hook, ch 1. Now on to the ribbed edge. Ch 2 (counts as first stitch), make tr in the remaining dc (28 tr). Fasten with a ss in the top of your ch2. Ch 2, * FP tr around the post of the next tr, BP tr around the post of the next tr * Repeat round ** out. Fasten with a ss in the top of your ch2. – 30. Repeat round 27. Cut and fasten yarn. Weave in all ends. Make one more mitten. Cut an fasten yarn. Leve a tail for sewing on thumb to the mitten. Make one more thumb. 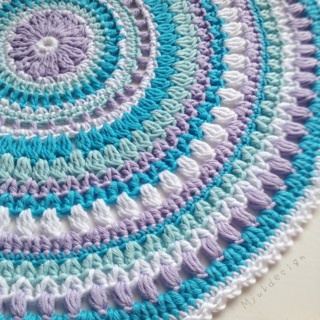 Abbreviations: ch-chain, ss- slip stitch, sc – single crochet, hdc – half double crochet, dc – double crochet, 5puff – 5 puff stitch, back post double crochet – BP dc, front double crochet – FP dc. The two last stitches makes the ribbed edge. You can find the tutorial for it here! Ch 2 (counts as first stitch), make dc in the remaining sc (28 dc). Fasten with a ss in the top of your ch2. 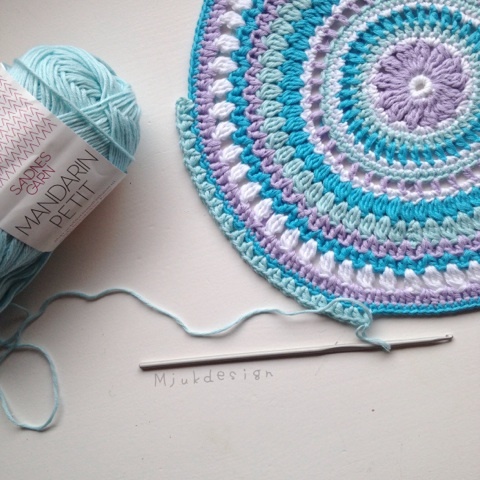 Ch 2, * FP dc around the post of the next dc, BP dc around the post of the next double crochet* Repeat round ** out. Fasten with a ss in the top of your ch2. Cut and fasten yarn. 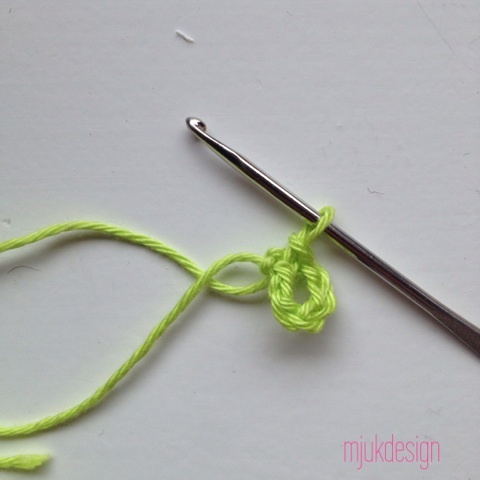 Leve a tail for sewing on thumb to the mitten. Make one more thumb. 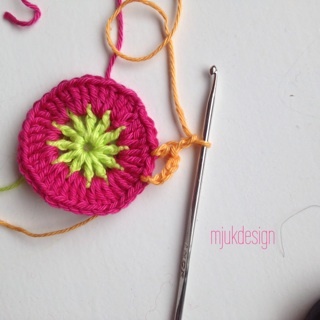 If you have any questions about this pattern (or other) please send me a mail at mjukdesign@hotmail.com . I would love to see your mittens, so if you make them and post them online, please use the #vikingmittens. 🙂 I hope your weekend brings lots of joys! Previous Post The Scaapi square! Next Post Dreams do come true!